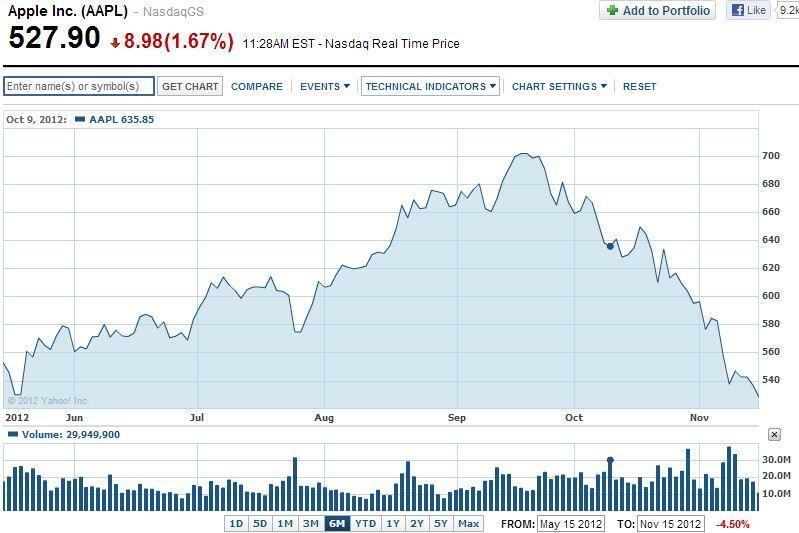 Apple’s stock has been tanking for the past several weeks, perhaps adjusting to market conditions. Here’s a trivial explanation for why a stock price might fall even when a company appears to be performing well: sometimes in a weaker market a firm’s stock price will decline to meet demand expectations, suggesting that perhaps it was too high before. One might assume, in that scenario, that it will climb back up to somewhere between its current low and its previous high. Right now, it’s trading at the lowest price since May, six months ago, as noticed by 9to5Mac. The stock price is around $529 at the time of publication, and its market cap is at $499 billion. In August, the company became the most valuable company in the world when its market cap hit $621 billion on a stock price of $663. It closed just above $702 in September. Pundits may be quick to point to the iPad mini, or the passing of Steve Jobs or even the recent shuffle in management as reasons why the stock is down. I’m not a financial analyst, but my guess is we’ll see it bounce back as it adjusts to the current market conditions.